In 2010, a pair of SF State professors worked with an East Bay organization for young scientists and 25 high school students to study air quality in West Oakland, a project that gave the local community an integral role in research aimed at making positive change. It was precisely the type of work Associate Professor of Health Education Juliana van Olphen wanted to promote when she, Associate Professor of Sociology Jessica Fields and visiting professor Nina Wallerstein formed the Community-Based Participatory Research (CBPR) Collaborative Center in 2009. 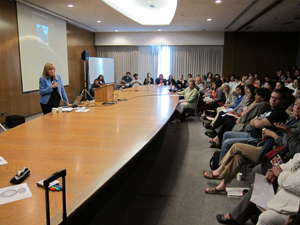 The Community-Based Participatory Research Collaborative Center hosted a CBPR conference last year and recently received a grant to host a second conference in 2013. The Center was formed for the Office of Research and Sponsored Program's (ORSP) 2009 Faculty Research and Creative Activities Retreat and subsequently received two years of ORSP funding. With the funding, the group has held monthly seminars to help faculty and students better understand how they can conduct community-participatory research, as well as funded several community partnership projects such as the West Oakland air quality study. Research often means a top-down approach in which the researcher parachutes into a community, dictates the terms and direction of the project and leaves once it's complete, said van Olphen. Community-partnership research attempts instead to create a bottom-up approach. "You're really turning the model on its head," she said. "It's about developing a close relationship with the community so that the community drives the research." By doing that, she added, this type of research helps community members learn how to address local challenges themselves. During the West Oakland study, researchers and students identified which areas of the neighborhood had the worst air quality and located potential sources of the pollution. Researchers were able to, with the students, present their findings at a professional conference and a meeting with policymakers. The students benefitted by realizing their own ability to advocate on behalf of environmental justice. "One of CBPR's goals is social justice and trying to increase equity," van Olphen said. "If we can build capacity within communities to engage in answering critical questions about issues such as health or education, we'll be better poised to address the root causes of those problems." The Center also hosted a CBPR conference in the summer of 2011 that attracted 120 scholars from around the world, and recently received a grant from the National Institute of Minority Health and Health Disparities to hold a second conference in June. Van Olphen hopes the conference will become a self-sustaining, biennial event. The Center is working on the event with several other Bay Area universities such as University of California, Berkeley, University of California, San Francisco and Stanford University as well as community partners such as Common Wheel and the Chinese Progressive Association. "We're trying to model the CBPR approach in the way we're planning this conference," van Olphen said. As with the seminars, the goal is to help professors, students and community members better understand how they can use this type of research to benefit both academia and the communities they serve. "There's an added value to using the partnership approach to research," van Olphen said. "The research you conduct is much more relevant and useful and can be more easily translated to programs and policies if it comes from within the community." This is the second in a series of articles highlighting institutes, centers and faculty affinity groups formed during the Office of Research and Sponsored Program's spring 2009 Faculty Research and Creative Activities Retreat. The next Research and Creative Activities Retreat will be held in the J. Paul Leonard Library on Jan. 23 and 24. To learn more or to reserve space for an affinity group, visit http://retreat2.sfsu.edu.